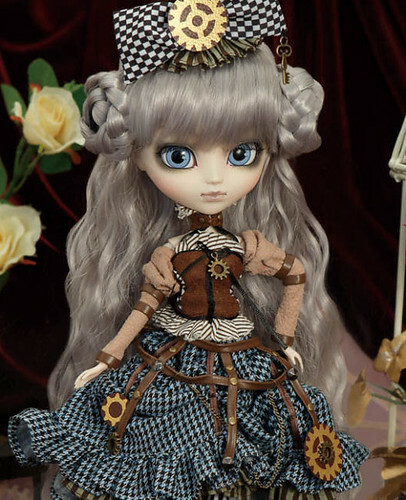 Pullip Mad Hatter in Steampunk World announced for July Release! Up for preorder @Pullipstyle (August Release)! Last night Groove officially announced the next doll in the Alice in Wonderland in Steampunk World series via their blog. Pullip Mad Hatter joins the already announced Pullip Alice in Steampunk World, who is set to be released in June (July here in the US) – who you can read more about here. Alice in Wonderland and steampunk have both been very popular themes for Groove releases over the years, I’m kind of surprised it took them this long to create a fusion of the two themes. We have had multiple iterations of Pullips as Alice but this is the first time we have seen Pullip as the Mad Hatter so while it is still Alice in Wonderland themed, the Mad Hatter is a bit unexpected and a welcome change of pace. 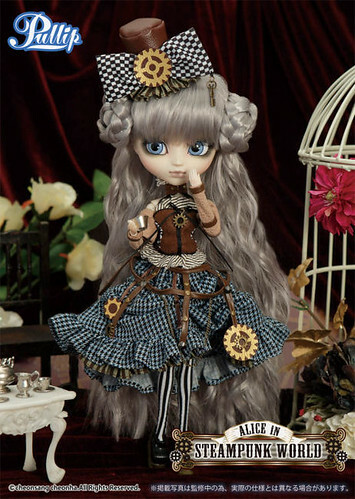 Pullip Mad Hatter has a MSRP of 18000 yen and is set to be released in July (August here in the US). Despite her being a July release, Mad Hatter is only the second non-collaboration Pullip design released this year it is nice to see designs by Ars Gratia Artis especially when they are as strong as this one. Like the gear which turning around….. TEA TIME is not over forever….. Why does the Escritoire resemble a crow?… Feel Like So. I am absolutely in love with this girl! I love that she is a really unusual girl, with colors that you really don’t see that often on Pullip like her her long flowing silver wig and her like grey scale face up. The face up itself is very unique with very intense smokey eye make up and gradient lips. I especially love the gradient lip color and the contrast of her piercing blue eyes with the minimalist coloring of her face up. I love the mix of textures and patterns in her stock outfit, the colors all work together surprisingly well. To me it seems like she incorporates the idea of being both steampunk and Alice-y much better than the actual Alice doll in this series, somehow she just seems much more well balanced. 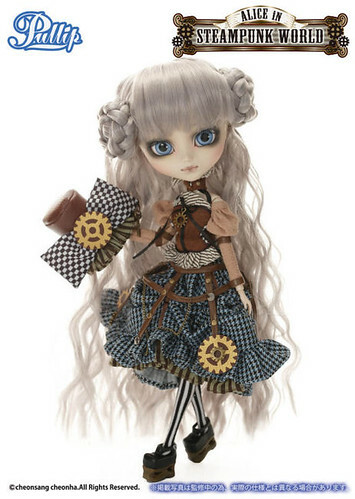 Of course, if you aren’t a fan of Alice in Wonderland she would still be an awesome addition to a steampunk Pullip collection. The Mad Hatter is already available for preorder via Pullipstyle. 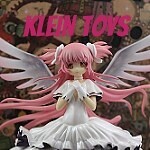 She is priced at $130 and is set for a late August release (the US gets Pullips approximately one month later than Japan). August can not come soon enough! 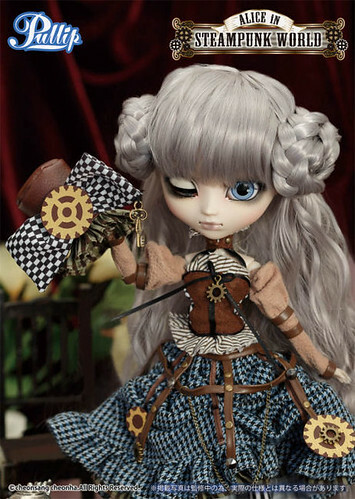 This entry was posted in Pullip and tagged 2015 pullip, alice in wonderland, mad hatter, Pullip, steampunk x alice in wonderland. Bookmark the permalink. 2 Responses to Pullip Mad Hatter in Steampunk World announced for July Release! Up for preorder @Pullipstyle (August Release)! WHERE THE HELL IS DAL!?! Maybe August/September? They are probably waiting to see how well Chibi Moon sells versus doesn’t sell.